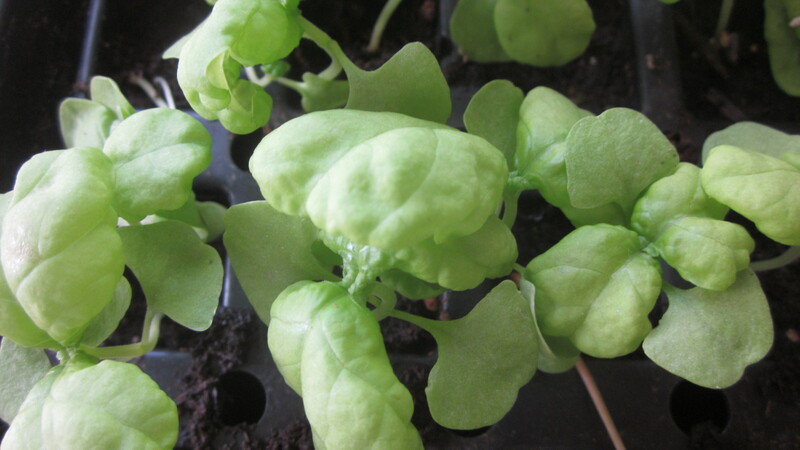 These lettuce-leaf basil seedlings are waiting patiently for the hoophouse to be finished, though I’m tempted to just plant them in another area, as they’re getting a bit raggedy looking. I woke up yesterday morning thinking about how many babies I’m responsible for this time of year. This year in particular, there are babies all over the place that need daily tending. I’m still working to get my seedling babies into the garden, and I’m planting new seeds every day in flats. The seedlings still in flats need daily watering and watching, and transplanting into bigger pots (if only I could just find those instructions on how to clone myself!). I’ve still got squash, melons, and some other goodies that need planting in flats. The building of our hoophouse has slowed down the planting of these seedings in the garden proper. I am inordinately pleased by the blueberries that are setting on this year. Can’t wait ’till these babies start turning blue . . . hope I can keep my hands off them until they are truly ripe! It seems a miracle that there’s so much fruit setting on this year, after last year’s disastrous drought. 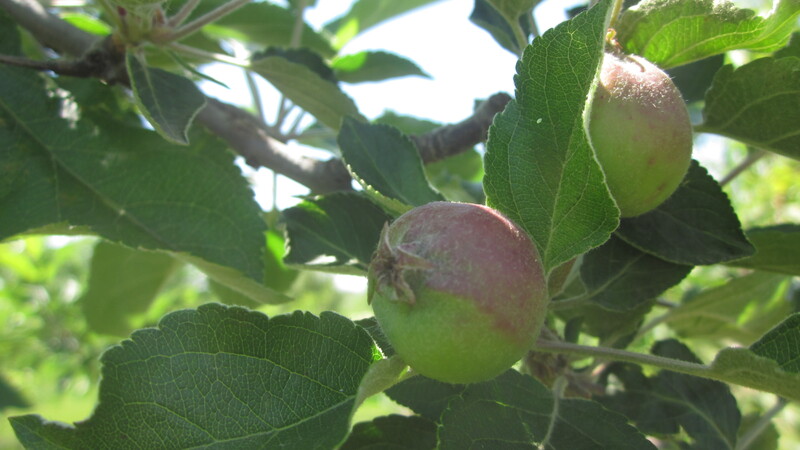 Perhaps all the fruit-bearers are making up for last year’s hot, dry and fruitless year? The rain we’ve had so far has perked up all the plants so nicely. And us people, too. 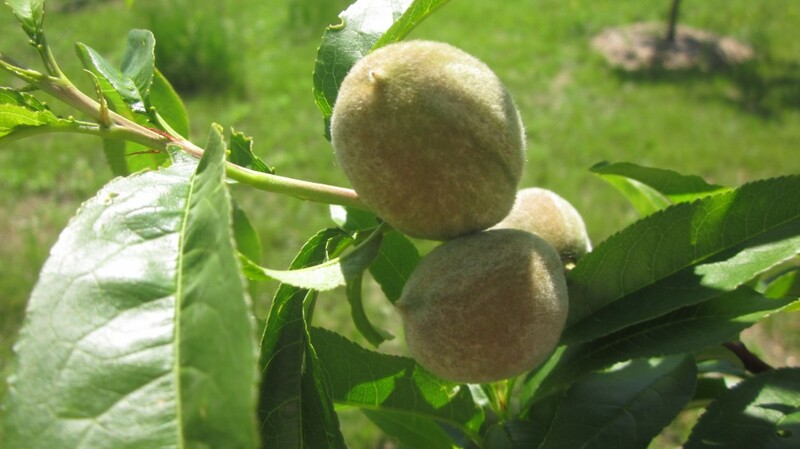 The peach trees are loaded. There aren’t many apples, and I don’t know why. Mayhaps Amalia and I got a little over-vigorous with the pruning shears this spring? We both enjoy pruning so dearly that sometimes we go a bit overboard. The ones that are setting on look very good. These already have a bit of a blush to them. Sweet,eh? It looks like we’ll have our first-ever pluot crop. 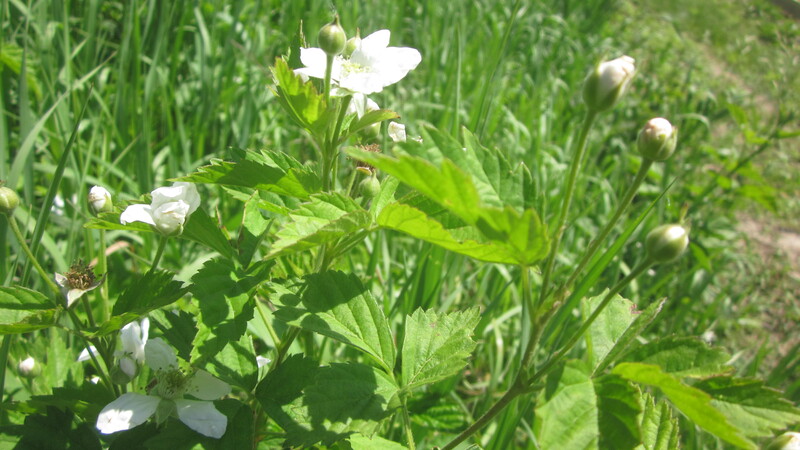 The dewberry brambles are covered with blossoms and buds, even though they are crowded by the brome grass. For berries this year, we should have plenty of blueberries, mulberries, dewberries, and perhaps a few raspberries. I can’t wait! 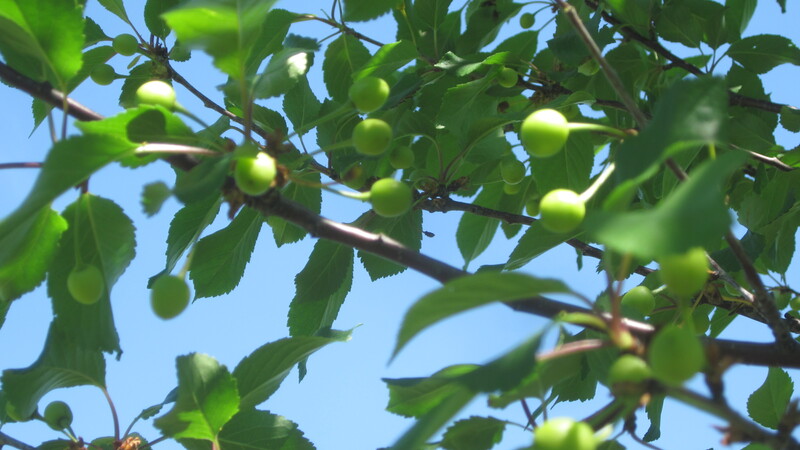 We have several Montmorency cherry trees–those sour cherries that are so delicious in pies–some are loaded, some are not. 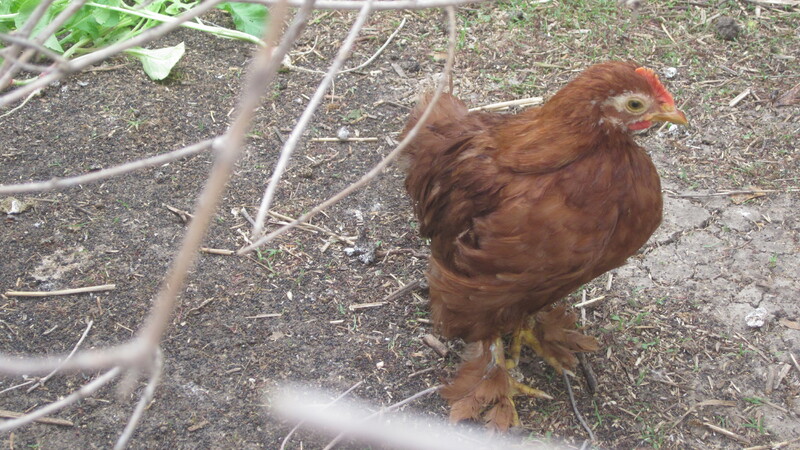 The Cornish chickens are going to outgrow their garage stock tank soon and will need to be moved outside. 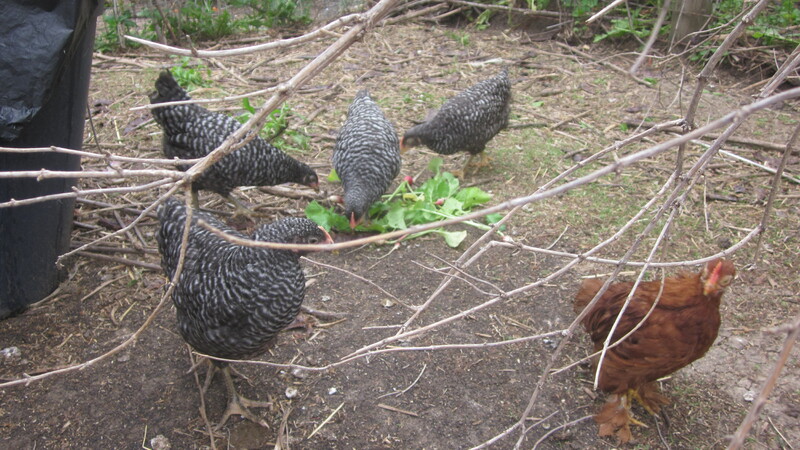 They eat so much and so quickly, I have to check their food and water supplies several times a day. 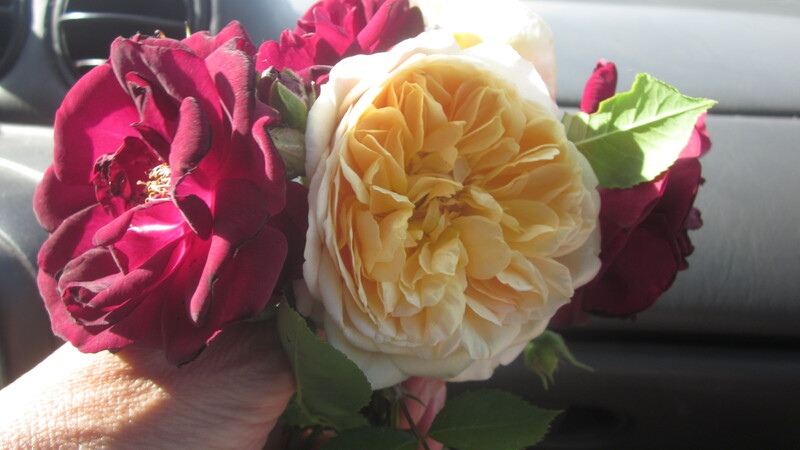 My own baby, little Mack, picked this lovely bouquet for me as we left the house last evening. In all the busy-ness and fruitfulness of the burgeoning summer, I’ve got to remember the darling human babies that I’m blessed with, too. Little Mack is 7 now, losing his teeth, losing his Swiss army knife (yes–woe is us!) and losing his baby fat. And picking me raggedy, torn-stem bouquets from the flowers that are blooming in my flower beds. And making a hide-out in a super-secret place, for the next time his cousin Orion comes to visit. He showed it to me, but I promised I wouldn’t tell anybody where it was. 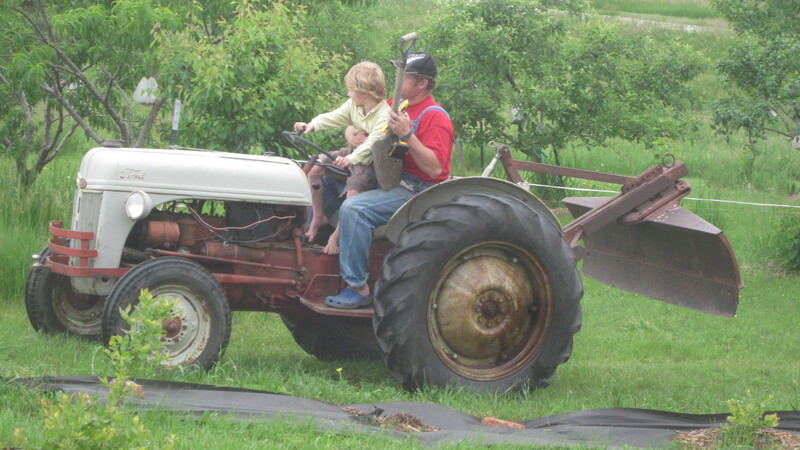 Here’s my baby–gulp!–learning how to drive the tractor on his Papa’s lap. 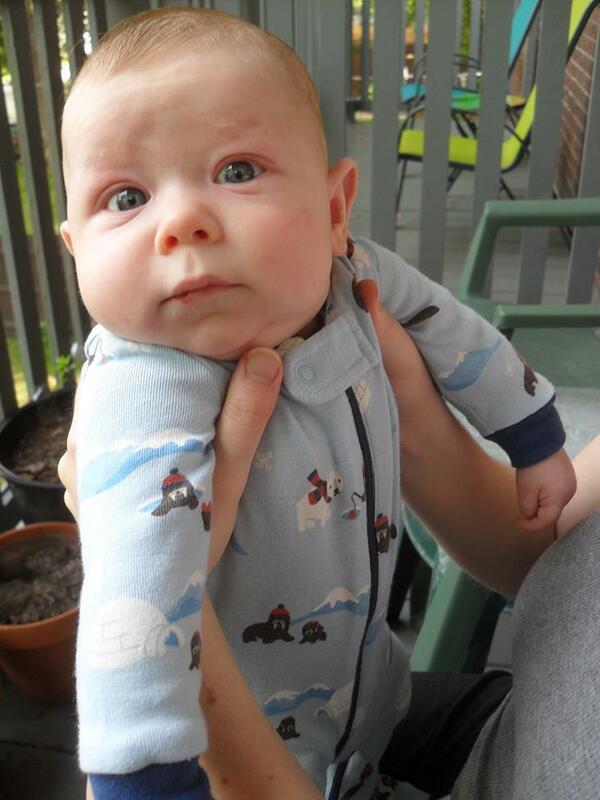 Here’s my darling little grandson, Emmett Adorableness Miller. (Image from Rachel Miller.) Doesn’t this picture just melt your heart? He looks so serious. He’s been asking his beautiful mama if she would please take him to Amma’s house, very very soon. Emmett’s mama and papa have promised to bring him to visit Amma (that’s me) in the next couple of weeks. I can’t wait to show him around the place. He’s probably never seen a chicken before. I can’t wait to nuzzle the back of his neck. 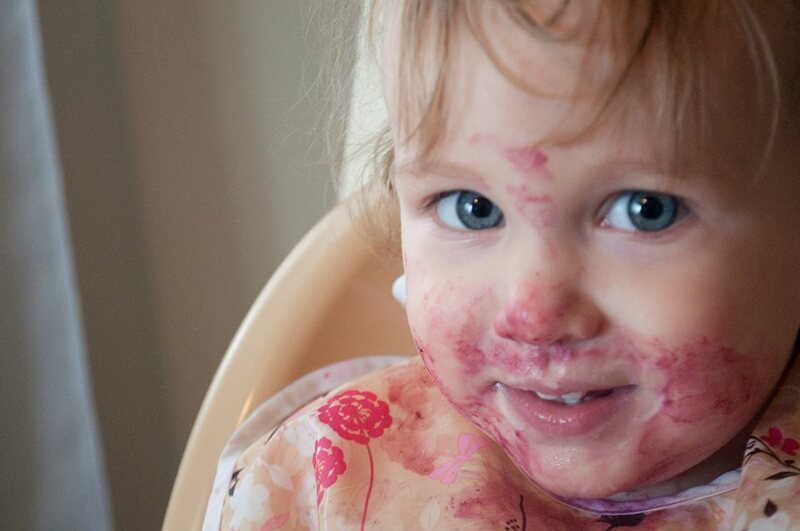 Oh, how Anya loves berries and yogurt! My granddaughter Anya is nearly 18 months old! She loves blackberries. Where did that year and half go, I wonder? *Sigh. * It went by much too quickly, that much I know! These are the “tweens” chickens that are now old enough to hesitantly check around outside, but will scurry away quickly if any of the bigger chickens show up. They are fairly tame around me, however. They know who butters their bread, as it were. This one is Malachi’s special pet, and her name is “Puffy.” Isn’t she cute? So tiny. I just love her. Here’s another new baby in the house . 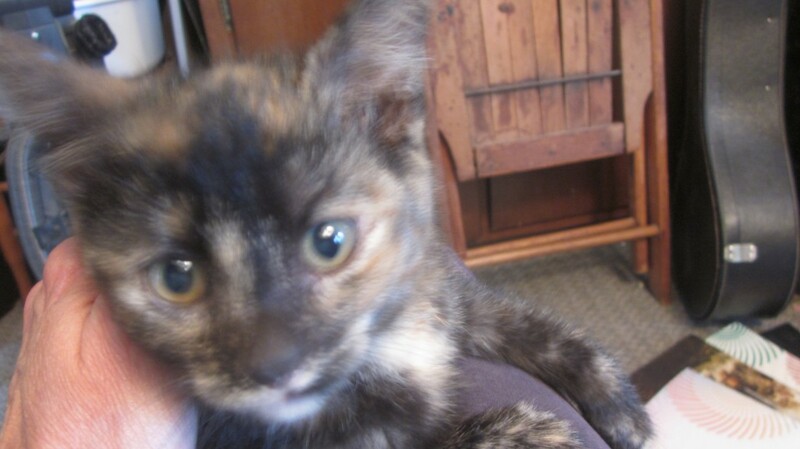 . . meet Samwise Gamgee, our new kitten. Most pictures are blurry like this . . .
Andrew and I were walking together in town early one morning, and we heard this pitiful mewing from under a car, right on main street. Andrew has a heart for cats and he got down on his belly to pull the kitten–scrawny, eyes matted, pitiful–out from underneath the car. Andrew’s wife Sonia is allergic to cats, so the little mite came home with me. She is so much fun. 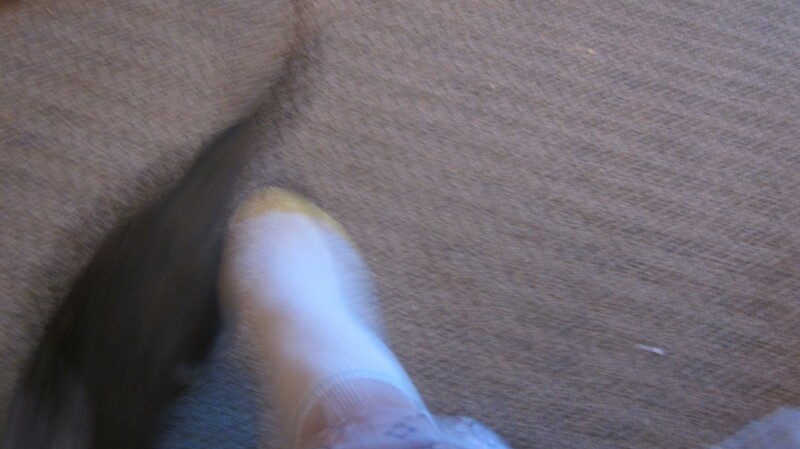 She’s fierce and sweet and is learning how to play with us with her claws sheathed. I hope. Most of the pictures I try to take of her turn out like this . . . maybe I need a new camera . . .? Of course the garden is just full of babies that require daily watering, until they are big enough to take care of themselves a bit. 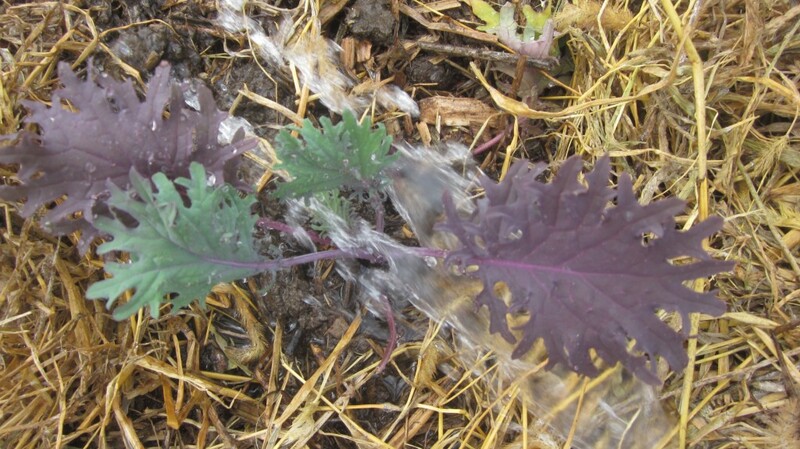 Baby Raggedy Jack Kale, from Baker Creek Heirloom Seeds. Baby common garter snake, or (Thamnophis sirtalis) curls around my gloved hand to pose for a picture. 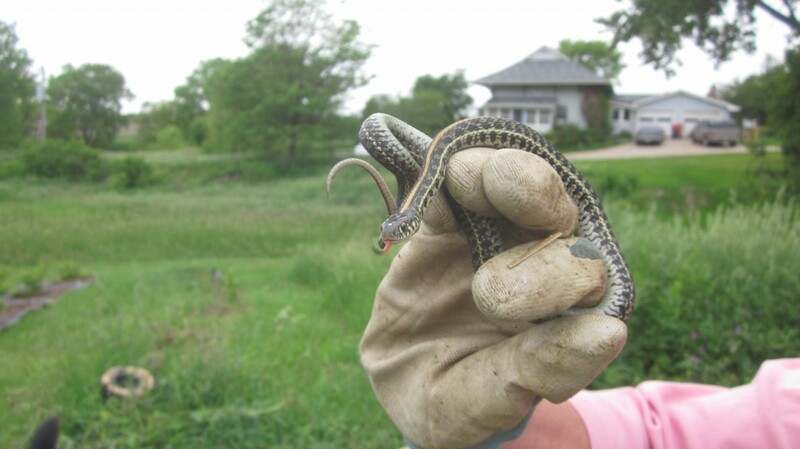 Today I was moving some mulch in my garden and found this little baby garter snake! I’m glad I had my gloves on, because I scooped it up really quick and called Malachi to come see. He came running. I guess I must have interrupted the little thing as he was just settling down for an after-luncheon nap, because he (get this!) writhed a bit, and then vomited! Several earthworms landed on the ground at my feet! Can you believe it? Have you ever seen a snake vomit? It’s pretty interesting. Springtime is the season for babies around here, it seems. They do add some hurry and busyness to the season, and a few extra steps taken, and undoubtedly much sweetness. So did you make the muffins, Carrie? 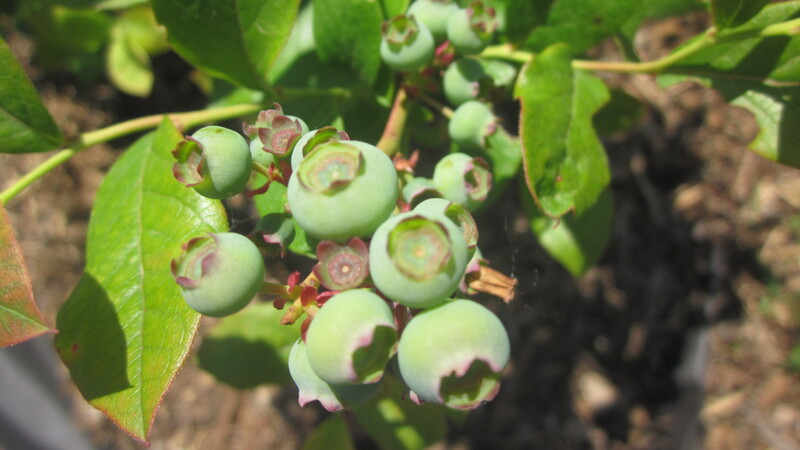 Do blueberry bushes grow wild in your area of the world? Yes, babies are wonderful, aren’t they, Caro? My “baby” (now in his 20’s) and his friend came over today to rebuild a fence that we had put up years ago to keep him (as a toddler) from ending up in a creek at the bottom of our small city plot. He’s just leaving now…all those “babies” grow up too quickly, don’t they. Meantime, I think you will love those pluots. They really do grow up too fast! Your place is gorgeous and everything and everyone looks so radiantly healthy and full of love! Thanks for taking a look, Bek! It is a lush and beautiful time of year here! What a wonderful blog for a grey Monday afternoon in London Town. It’s just lovely. Thanks so much for sharing your treasures with us. What abundance. 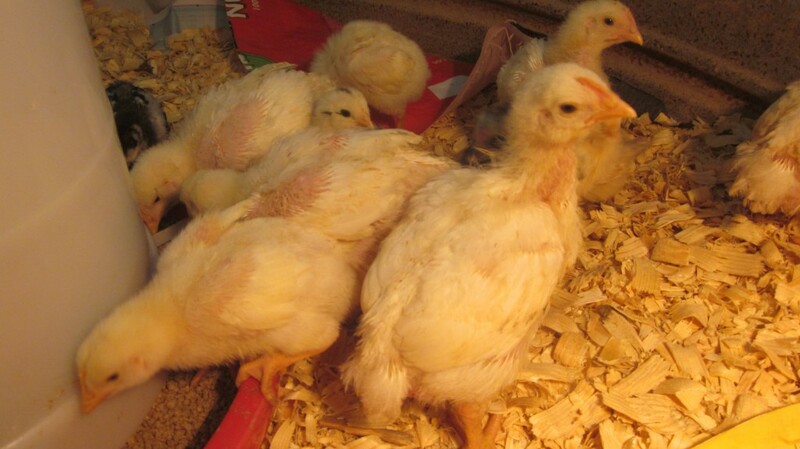 Love the grandbaby and the half-grown chicks. And the fruit production is amazing. I’ve never heard of a pluot. One of them is shaped a bit like a mangoe. I know, what abundance, isn’t it amazing, Francene? 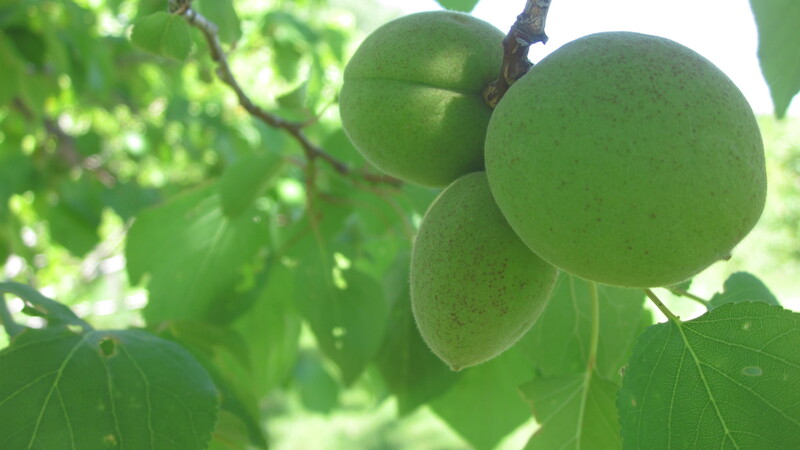 We’ve had a long cool spring and plenty of rain (this far) and that seems to be the formula for lots of fruit! A pluot is a cross between a plum and an apricot, though that tree has never borne fruit before. Can’t wait to see what they are like! wow, how do you find time to write a blog. Bake for the fair and get a little afternoon nap, well I guess that you don’t get an afternoon nap. We will be tilling about seven acres next spring on one of our properties in Mexico, where we have decided to build a retirement house. Yesterday while enjoying some outdoor time with my wife, I suggested that we might need a tractor in Mexico. That is when she informed me that she bought a burro about three weeks ago before leaving to come home. It is being housed at a brothers house until we get there at the end of the year. And yap, she fully expects me to plow the field walking behind the burro……oh how I look forward to that (he said, tongue in cheek) Great pictures, it looks like you’ll be having a great harvest for all your hard work. Oh, Chef, how I look forward to seeing pictures of your following that burro as you plow the field! 🙂 Be sure to arm your lovely wife with the camera, on that day!